Which means I won't be knitting a swatch for the chemo cap pattern either. 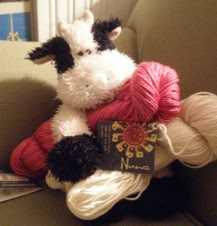 I will however have Victor LaVache here, Hugs' newest yarn host and model, on my shoulder while I work. He is as warming as a handknit shawl, and so cute!